There were rare scenes of admiration and pride in Buncrana Court last week, when Inishowen’s newest solicitor was formally introduced to the local courts. Killian McLaughlin, son of popular Buncrana solicitor Ciaran MacLochlainn, took his seat amongst his fellow solicitors to contest his first ever criminal case in front of the District Court. A past pupil of Scoil Mhuire, Buncrana and the University of Ulster Magee, 29-year-old animal lover Killian also completed a degree in Zoo Management at Winchester University in Britain, before deciding to follow in his father’s footsteps into law. 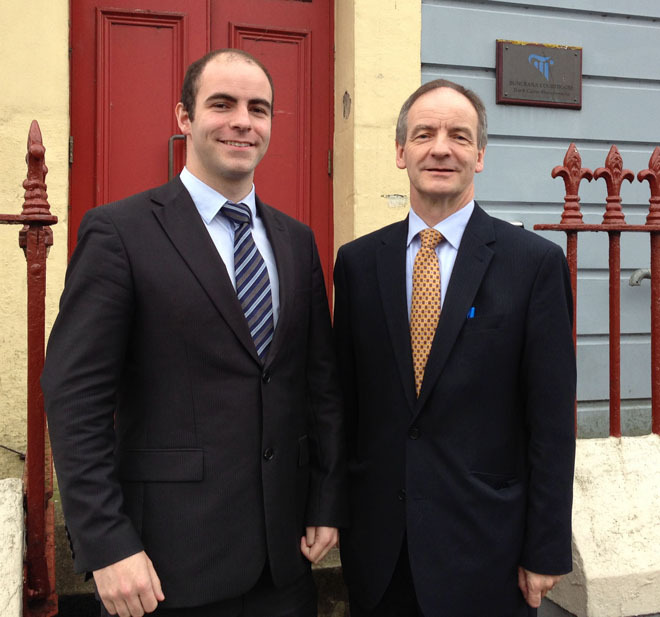 Introducing Mr. McLaughlin to the court, long serving solicitor Philip White said it was an “great honour” to introduce the young solicitor – noting that it was not something that was “so frequent” anymore. He joked that Mr. McLaughlin’s degree in Zoo Management might help him deal with the “exotic and colourful characters” that they sometimes encounter in the legal system.